This image shows damage from the 1927 Flood. 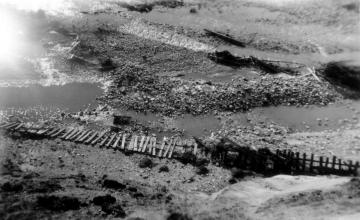 A damaged railroad track runs across the foreground with water, boulders, coarse woody debris, mud, and small rocks filling the rest of the image. No vegetation is visible and the season is fall. The fence line running through what now looks to be a stream bed suggests that perhaps a river carved a new channel during the flood.